On this episode of Valley’s Gold, host Ryan Jacobsen goes back to his Bulldog roots to highlight the highly-regarded Fresno State Agricultural program and the Fresno State Farm. Ryan starts his visit with newly-installed University President, Dr. Joseph Castro. Then he makes a stop at the livestock area with Ag Students, Levy Randolf and Audra Roland and learns first-hand the high level of commitment the program requires. Fresno State Farm Manager, Mike Mosinski, takes Ryan a wide-ranging tour, including a stop at the sweet corn field, and shares the many ways students acquire hands-on experience in all aspects of agriculture – from the field to marketing the products. Daniel Avila shows Ryan through the Dairy Processing Unit and, naturally, he just MUST sample the delicious cheeses, ice cream and even iced tea! Finally, Ryan and Dr. Charles Boyer, Dean of Jordan College of Agricultural Sciences and Technology tour the Gibson Farm Market where Fresno State’s many products are on sale to the public, including award-winning Fresno State Wine. The day ends with a delicious bite of signature Fresno State ice cream – a tasty treat for ANY Bulldog fan! On April 10, 1910, the California State legislature approved a bill to establish a “normal school” in Fresno. the purpose was to serve the educational needs of the San Joaquin Valley by training prospective teachers. At the time, Fresno was, as it is today, the largest city within a 200-mile radius in the Valley, with a population of 32,000. The original enrollment was 170 students, most of whom were women, and tuition was…free! 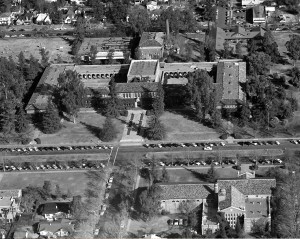 Fresno State Normal School, as it was called, grew steadily until 1921 when it became Fresno State Teachers College and offered a four-year bachelor’s of arts degree in education as opposed to the previous two-year general education degree. In 1935, additional degree programs were added and the school officially became Fresno State College. the College started granting master’s degrees in 1949, but it wasn’t until 1972 that the school got official university status and was renamed California State University, Fresno. The campus was relocated to its current site in 1954/55 from the original campus, now Fresno City College.